Check out our 3 Party Menus Below and call today to book your next party with us! Europa Restaurant is available for private events for up to 80 guests. All private event bookings are handled personally by the owner. Whether you are planning a simple dinner or an elaborate multi-course meal let the staff at Europa Restaurant take care of it all. 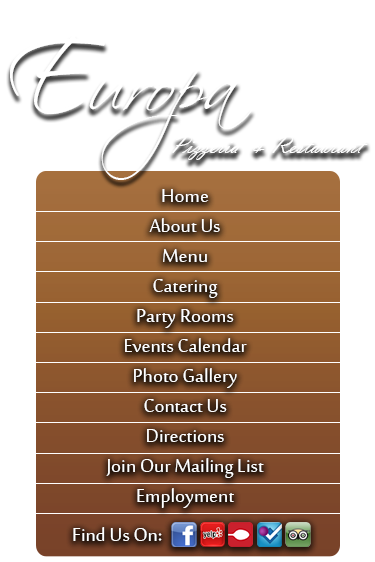 We offer customized menus, a full bar selection and hassle free planning for your event. You will recieve excellent service and accomidations at an affordable price. • Holidays or ANY function you desire! • Or ANY function you desire! Call today for more information about our Party Packages & Specialty Platters! Party packages available to accommidate all budgets! Appetizer Platters, Dessert Platters, Cookie Trays & Specialty Cakes made to order are also available! !